In a large skillet over medium high heat, melt 1 tablespoon of butter. Add diced peppers and onions and 1 teaspoon of House Seasoning Blend and cook until softened, about 6 minutes. Add garlic and cook for 30 seconds more. Remove vegetables from the pan and add remaining tablespoon of butter. Season the shaved beef and add it to the skillet. Cook beef until no longer pink, about 5 minutes. Remove skillet from heat and drain off excess fat. Stir in Worcestershire sauce, 3/4 of the provolone and American cheeses and add the pepper and onion mixture back into the pan. Pour half of the Alfredo sauce into the bottom of a baking dish. 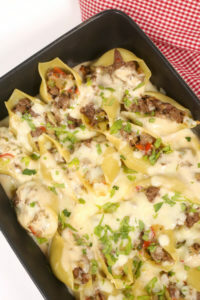 Spoon the filling into the prepared pasta shells and arrange in the baking dish. Pour remaining Alfredo sauce on top of the stuffed shells and top with the remaining cheese. Bake at 350 degrees for 10 minutes or until cheese melts.